This newly designed drinking straw bending machine dramatically increases productivity. 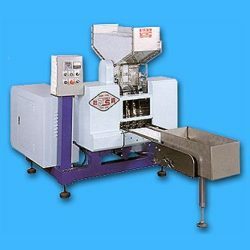 Compactly constructed for reduced space requirments, this high efficiency machine provides user-friendly automatic operation. 2. High production rate of 500 ~ 700 (pcs/min). 3. Automatic product counting Product quantity pre-set. Once the pre-set value is reached. the alarm will sound, allowing added convenience for quantity packing into bags. 5. Automatic machine stop in the event of straw jamming.